As we gear up for the holiday season, many of us in Canada will be hosting friends and family at various parties, holiday suppers, and other seasonal entertainments. While we look forward to the fun, there is a lot to think about in terms of organizing food and decorations. Let Bloomex make it easier for you! This year Bloomex provides you with fresh and beautiful Christmas Centrepieces that provide a simple and elegant way to dress up your holiday home or table this year. These gorgeous centrepieces will make your holiday events more memorable and festive. Each one is made up by our professional floral designers and will add instant holiday cheer to any home. These centrepieces also make a thoughtful holiday gift! Send some Christmas spirit and help warm someone’s home for the season. Each very special Christmas Centrepiece contains lovely candles with assorted fresh holiday greenery and gorgeous holiday flowers such as roses, carnations, and gerberas. All are artfully arranged with decorative ribbons and special floral foam that will keep your centrepiece fresh for at least a week. There are a total of 8 arrangements to choose from! 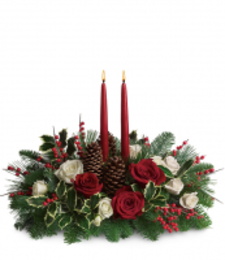 See all the wonderful Christmas Centrepieces and make your best selection. Happy Holidays from Bloomex!